The authorities just notified you that you have 20 minutes to evacuate your home before a raging wildfire cuts off the exit from your neighborhood, leaving you trapped. The fire is advancing at the rate of a football field every second, so the actions you take in the next few moments will determine whether you and your family live or die. What are the 12 must-have items in your go-bag? ID and other essential documents: Bring copies of your passport, driver’s license, and/or state ID card and store them in a sealed ziplock bag. Other documents to consider packing include the deed to your home, vehicle titles/registration, printed maps, and a recent family photo with faces clearly visible for easy identification. Cash: Carry at least $250 in relatively small bills, and keep it with your ID in a waterproof bag. Shelter: A lightweight tent, along with mylar emergency blankets can help keep you warm and dry. Water and a water filter: You’ll need at least one gallon of water per person per day. Bring as much bottled water as possible, but also include a water purification straw and/or purification tablets, along with a steel container to boil water in. A multi-tool: These modern-day Swiss Army knives come with a wide array of essential tools, from a knife and screwdriver to tweezers and a can opener. 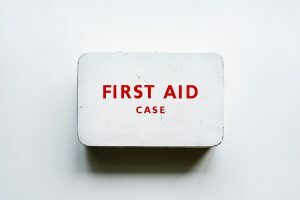 First-aid kit and prescription medications: Whether you buy one ready-made or pack your own, the likelihood of injury skyrockets in the wake disasters, so not having a first-aid kit can be deadly. And don’t forget to include prescription medications and other life-sustaining medical supplies if needed. Light: Flashlights with extra batteries are great, but headlamps are even better because they’re ultra compact and leave your hands free. An emergency whistle: Emergency whistles can alert rescue crews and help locate others in low-visibility conditions. Solar-powered emergency radio and cellphone charger: Without power, you’ll need a way to stay in touch with the outside world. Today you can find devices that include a combination radio, cell-phone charger, and flashlight all in one, with the extra option of hand-cranked power to keep things charged even in the dark. Sanitary items: Pack toilet paper, baby wipes, hand sanitizer, soap, as well as tampons and/or pads if needed. Clothes: You only need enough clothes to keep you warm and comfortable for a few days, so don’t try to bring your entire wardrobe. Stick to essentials like underwear, socks, extra shoes, a jacket, a poncho, a hat, and gloves. You’ll need to tailor your clothing to the particular climate and region you live in, so colder locations may require extra outerwear. Food: Focus on high-protein, high-caloric foods that will give you the energy you need to live and get from point A to point B. The most recommended options include, energy bars, MREs (Meals-Ready-to-Eat), freeze-dried survival food, and meal-replacement shakes.